There's nothing like an old Jewish joke told in Yiddish by a veteran Yiddish speaker for whom these jokes are part of his vocabulary. Such storytellers in the original Yiddish are getting harder and harder to find. Interest in old Jewish jokes told by old Jews has grown in the last few years, as we have seen with the popularity of the website Old Jews Telling Jokes and the recent publication of many of these jokes in book form. In 2007, a Jewish Heritage tour of Ukraine featured Klezmer musicians and other entertainment while cruising along the Dnieper river. The participants in the cruise, called Dnieper Shleppers, were treated to a virtuoso stream of Yiddish joke telling by Abe Bartel, an elderly Yiddish speaker from Paris. 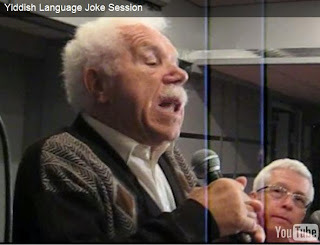 The audience howled with laughter as the jokes, some of them off-color, were translated in deadpan style by Professor Eugene Orenstein of McGill University. Here is a video of the joke session. Listen carefully and enjoy! We're taking a few days off from posting as we celebrate Shemini Atzeret, Simchat Torah, and Shabbat. We'll be back posting our usual mix of funny stuff on Sunday. Chag Sameach and Shabbat Shalom!